No one would disagree that fresh water is a scarce resource around the world. Over recent decades, the cost of water has surged and the problem is exacerbated in commercial environments. “At home, a tap in the bathroom may be used 10 times a day while in a commercial building, each tap in the washrooms may be used 1000 times daily,” states DELABIE Sales Director Asia, Sébastien Jeux. 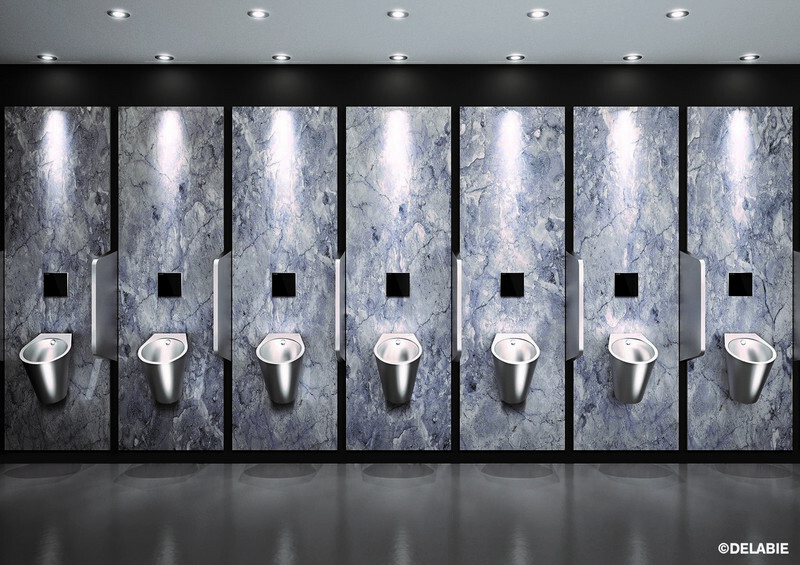 “This makes water saving of critical importance in public environments and the solution can begin with intelligent use of technology.” DELABIE, European specialists in commercial water controls with 90 years’ experience, develops innovative solutions for public washrooms. In order to achieve a range of global goals, including addressing climate change, creating sustainable and thriving communities, green architecture is effective and efficient. The evidence that green architecture brings multiple benefits is growing. Importantly, going green not only saves natural resources, but also the owners’ money by reducing energy and maintenance costs, reducing unnecessary expenditure. With green architectures movement has been swept across the world and growing understanding of green construction, innovative technologies are being developed to keep pace with increasing shift towards sustainability and shaping the sustainable design. Interestingly, while most urinals and toilets are flushed with sea water in Hong Kong, this remains an exception on the planet. However, it may soon change. “Flushing toilets with potable water is considered to be absurd nowadays. The next generation of green buildings will recycle grey water or use sea water to flush the urinals and the toilets,” Jeux notes. Saving water used by urinals is always a good idea, but it must be well-balanced. DELABIE explains that if the urinal is not correctly rinsed, unpleasant odours and hygiene become a great concern while the pipe sewage quickly gets blocked with urine crystallization. However, technology can help to limit waste without compromise. This is why DELABIE recently developed its TEMPOMATIC 4 urinal valve, a highly water-efficient solution which has been awarded Winner at the German Design Awards competition in 2018. This intelligent urinal valve can detect high-frequency periods and adapt its rinse accordingly. During peak hours, only the urinal bowl is rinsed between two users. After the busy period, an additional rinse occurs to clean the bowl completely and renew the water in the trap. The TEMPOMATIC 4 urinal valve offers 3 programmes according to the urinal type, each with an optional hygienic duty flush. DELABIE stresses that the duty flush can be programmed after the last use to flush the pipework and prevent the crystallization of uric acid, water stagnation and back flow due to system vacuums. Besides, not only potable water can be saved as TEMPOMATIC 4 urinal valve is fully compatible with sea water and grey water as well. As a result, this is more efficient and less wasteful. The watertight seals in the mechanism of cistern flushing systems are very sensitive to the accumulation of scale and impurities. This issue especially arrives promptly when using sea water or grey water. Jeux warns: “The cistern technology is a source of leaks which are not always noticed because they are inaudible and not easy to see. 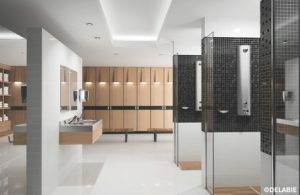 Because facility management teams usually do not have the time to regularly clean the cisterns, the amount of wasted water is colossal.” Designed for the commercial use, DELABIE has introduced direct flush technology, TEMPOFLUX 3 WC, which not only reduces waste and saves water, but also improves hygiene. “The mechanism harnesses the system’s dynamic pressure to provide a powerful rinse. The flush is instantly available so there is no cistern refill time and no opportunity for water to stagnate,” says Jeux. TEMPOFLUX 3 is comprised of a robust mechanism so that it can withstand intensive use in commercial toilets. Importantly, successive flushes are available instantly so users do not have to wait should they need to flush a second time. This contributes to reduce the waiting queue in the busy washrooms. Thanks to its dual flush function with flush volumes which can be adjusted down to a minimum of 2/4 litres per flush, TEMPOFLUX 3 sets a new benchmark for green toilets. Generally domestic showers focus on comfort but often neglect water efficiency. 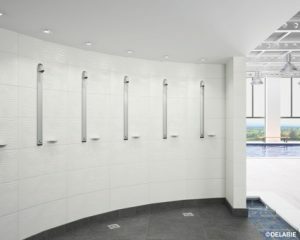 Installed in intensive use environments where users may not be very conscientious and fastidious, the water and energy consumption on such showers is massive. DELABIE’s TEMPOMIX 3 Time Flow Mixer equips hydraulic timing which closes automatically after 30 seconds to prevent unnecessary waste when the user soaps and to ensure the valve is off when the user leaves. By splitting showering time into wetting, soaping and rinsing, up to 80% water savings can be achieved compared to domestic showers. It is good news for the planet and for the owner’s money. 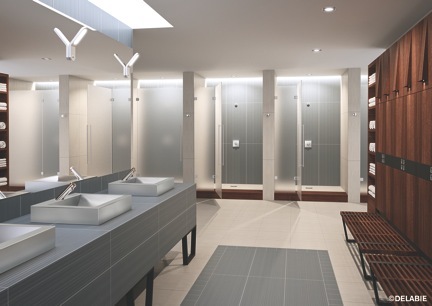 “Just based on the water and energy savings, the return on investment on DELABIE time-delay showers is achieved in a matter of a few months,” Jeux adds.